Last fall when MinnState Chancellor Devinder Malhotra forwarded an article about Leech Lake Tribal College, a tiny two-year college in northern Minnesota. Leech Lake Tribal College was rated by WalletHub as number one in the nation. This rating caused some intrigued. The LLTC website was personal, written in a warm, one on one style. Contained therein were the spellbinding images and text about the Seven Grandfather Teachings of the Anishinaabe—Gwayakwaadiziwin, Debwewin, Inendizowin, Zaagi’idiwin, Nibwaakaawin, Zoongide’iwin, Manaaji’idiwin—translating to Honesty, Truth, Humility, Love, Wisdom, Courage, and Respect. 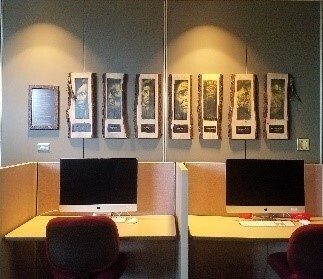 The HTC Brooklyn Park Centers for Student Achievement thought it would be inspiring to recreate the images and honor them by displaying them in the Brooklyn Park Campus Learning Resource Center. Granting permission to use the material, Leech Lake Tribal College President Patricia Broker requested only two things—that Leech Lake Tribal College is acknowledged and that the Ojibwe words are larger than the English. This was enthusiastically agreed to and the project then became departmental teambuilding and cultural awareness goal. Thus began a long process of artistic trial and error, starting with the purchase of rustic, bark-edged pine boards from the Amish of Wisconsin. The boards needed considerable prepping and Tim McCourtney of the Brooklyn Park Campus Learning Resource Center offered to work on them. Once prepped properly the image transfering began. Members of the Brooklyn Park Centers for Student Achievement were invited to help with the creation of the boards. Karen Hartneck and Sara Laviolette worked on the feathers and beads that adorn two locations on the boards, and with Pamela Mueller’s expert guidance on the graphics, designed the frame of text to coordinate with the boards. Sara later applied the many unifying and finishing touches and the boards were ready for hanging. Honoring the Seven Grandfather teachings of the Anishinaabe had become an almost spiritual creative experience. Finally, the day of the unveiling arrived, an overcast April day for a solemn occasion. The location was conveniently already lit from above with “museum” lighting, which added to the drama of the black drape and red dedication ribbon. Patiently waiting for the big moment, guests enjoyed Mahnomin Porridge, a recipe originating from the White Earth reservation and based on wild rice which is sacred to the Ojibwe. The ribbon was cut and the dedication read—to all things living and departed and to the spirit of living well—which is what the teachings are all about. As the drape fell, a gasp rose up from the crowd, followed by a reverent silence. A better reaction could not have been asked for. Sara addressed questions about the history of the teachings and process of creating the boards, including pronunciation of the Ojibwe words which she had learned from classes at Robbinsdale Armstrong High School. Many others have viewed the boards since and the images and words continue to inspire every day.